This past weekend the “Road to the Kentucky Derby” ran through Gulfstream Park, Aqueduct and Santa Anita Park this past weekend, leading to some shuffling in week two of the National Thoroughbred Racing Association (NTRA) Top 3-Year-Old Poll, results of which were released Monday. Moving right to the top in first place is the undefeated Irish War Cry (7 first-place votes, 303 points) who posted a mild upset as the 3 3/4-length winner of Saturday’s Lambholm South Holy Bull (G2), at Gulfstream Park for trainer Graham Motion. For his win in the Holy Bull, Irish War Cry earned 10 points toward a starting berth in the Kentucky Derby (G1) at Churchill Downs May 6 and currently is ranked 8th on the Kentucky Derby Leaderboard. In winning the Holy Bull, Irish War Cry defeated last year’s champion 2-year-old male and Breeders’ Cup Juvenile (G1) winner, Classic Empire (8 first place votes, 272 points), the 1-2 favorite who finished third and drops down to third from first in this week’s poll. Classic Empire is ranked number one with 32 points on the Kentucky Derby Leaderboard. Remaining in second with 10 points and ranked 11th on the Kentucky Leaderboard is McCracken (8 first-place votes, 289 points), who has yet to make his 2017 start for trainer Ian Wilkes. Rounding out the field are: Mastery (7 first-place votes, 252 points); Withers S. (G3) winner, El Areeb (2 first-place votes, 225 points); Las Virgenes S. (G2) winner, Unique Bella (6 first-place votes, 172 points); Gormley (2 first-place votes, 172 points); Mo Town (1 first-place vote, 110 points); Practical Joke (100); and American Anthem (78). 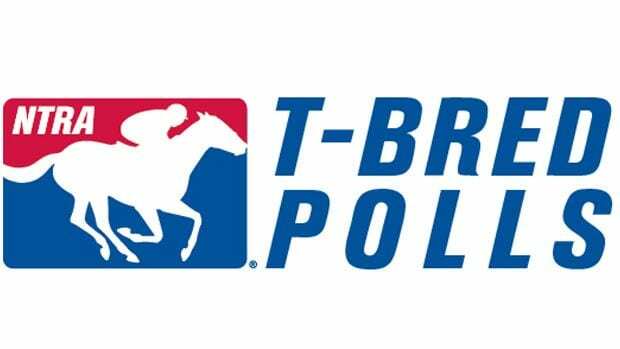 The NTRA Top Thoroughbred Poll for all horses shows little movement in this week’s rankings while racing was mostly focused on the sophomores. However, probably the biggest change in the top-ten this week is the absence of two-time Horse of the Year California Chrome who dominated the polls for over the last two-years. California Chrome was retired to stud duty and is standing at Taylor Made Farm in Kentucky. The 2016 Eclipse Award Champion Three-Year-Old Male, Arrogate (41 first-place votes and 410 points) received all first place votes after his spectacular win in the inaugural running of the $12 million Pegasus World Cup Invitational (G1) at Gulfstream Park on January 28. Ranked second and third respectively are two 2016 champion females: Songbird and Tepin. The 3-year-old Eclipse Award filly of 2016, Songbird (331) and Eclipse Award Turf winner Tepin (282). Both females are currently in training as they ready for their 2017 debut. Rounding out the top-ten are: Shaman Ghost (216); Gun Runner (189); Hoppertunity (139); Drefong (92); Neolithic (73); Lady Eli (70) and Unique Bella (60).